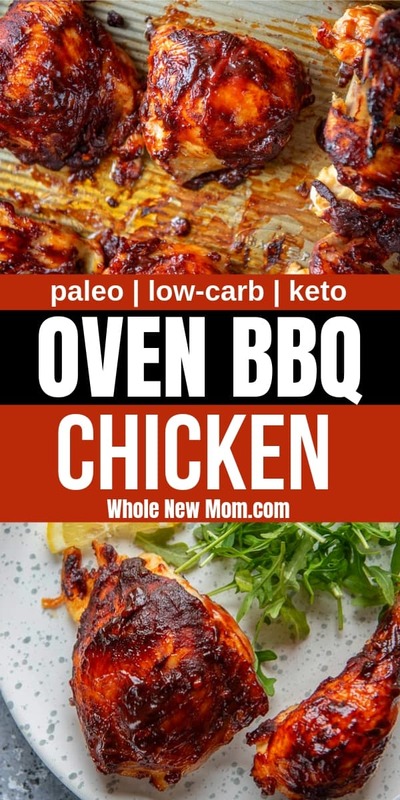 With this Low-carb Oven BBQ Chicken, you can enjoy great BBQ taste without the grill and the carbs! Well, it is still pretty cold here in West Michigan, and as of two days ago there were still about 7 inches of snow on the ground. Not quite grilling weather yet. But that didn't stop me from following through on satisfying a craving for barbecued chicken. 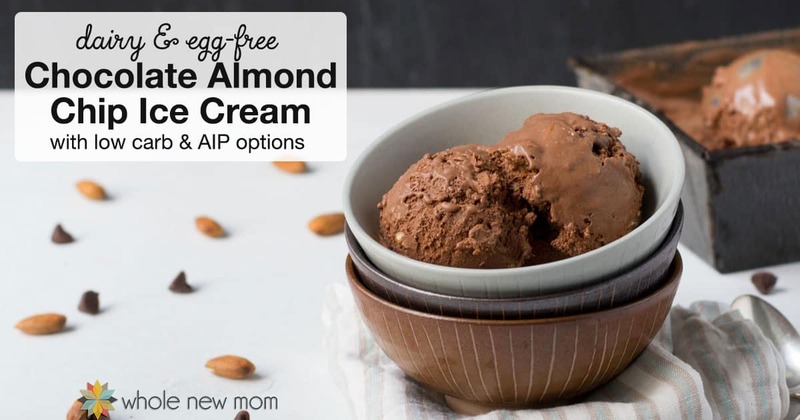 We have been trying to add more animal proteins to our family diets since my diagnosis with adrenal burnout and copper overload. I will be posting more on this in the near future, but suffice it to say that I think that these are today's epidemics. 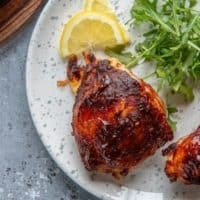 One of our favorite recipes is one that I just found and recreate this past week — OVEN BARBECUED CHICKEN!! Everyone loved it so much (and I had made 2 whole chickens) that even after all of those leftovers, I did a repeat performance last night. One of the neat things about this recipe is it put my new-found chicken cutting talents to the test. I recently went to a demonstration by Tilling to Table at a local chapter meeting of the Weston A. Price Foundation, where I learned how to deal with a whole pastured chicken. Well, I am embarrassed to say that until I saw it done, I had never cut up a whole chicken in my life. So now in two weeks, I have cut up 5! 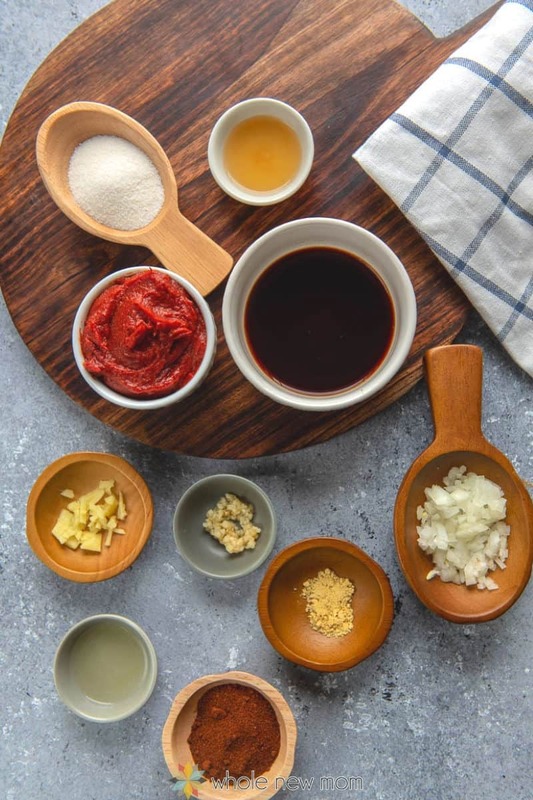 As I have mentioned before, our family is off of almost all forms of sugar, so I used alternative (as healthy as possible) sweeteners for the sauce. 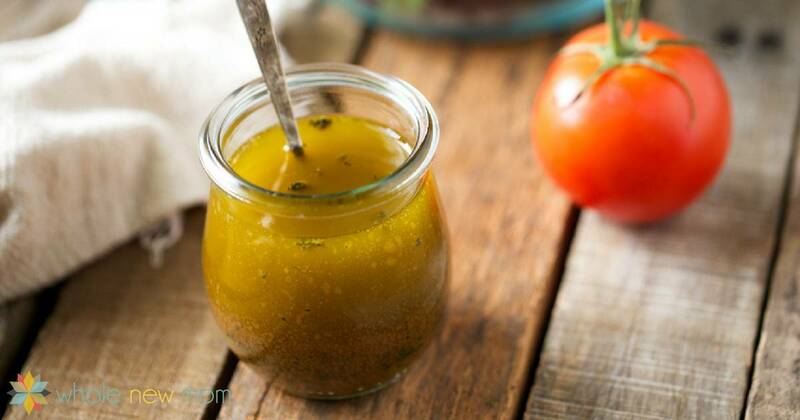 The recipe for the sauce is a modified version of one from the recipe forums on Whole Approach. You can use Bragg's liquid aminos if avoiding tamari. Here's how to make your own chili powder. Substitute lemon juice for apple cider vinegar if not tolerated. 1/4 tsp organic garlic powder can be used instead of a clove of garlic. You can substitute 1/2 tsp dried minced onion for the fresh onion. 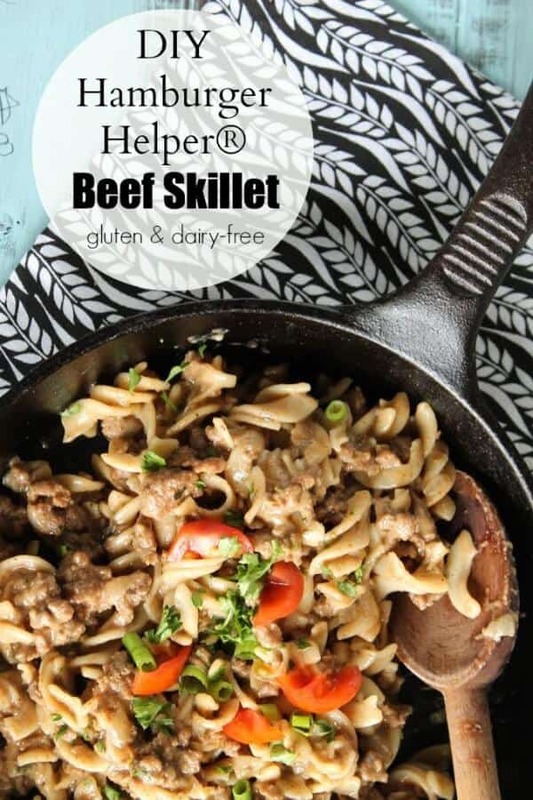 1/8 tsp organic ground ginger can be substituted for a small chunk of ginger. You can substitute any healthy sweetener for the xylitol, but you may need to use a different amount if using a liquid sweetener so read this post on substituting sweeteners. If using stevia as your sweetener, use 1/16 tsp. 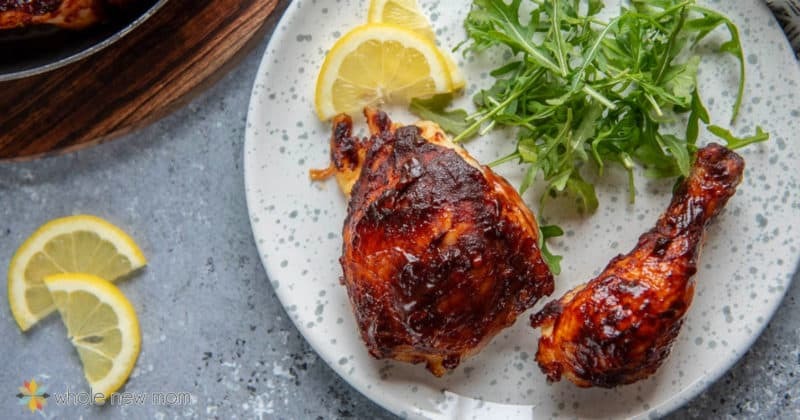 This Oven Barbecued Chicken is one of our favorite meals - easy to pull together even when it's not grilling weather. 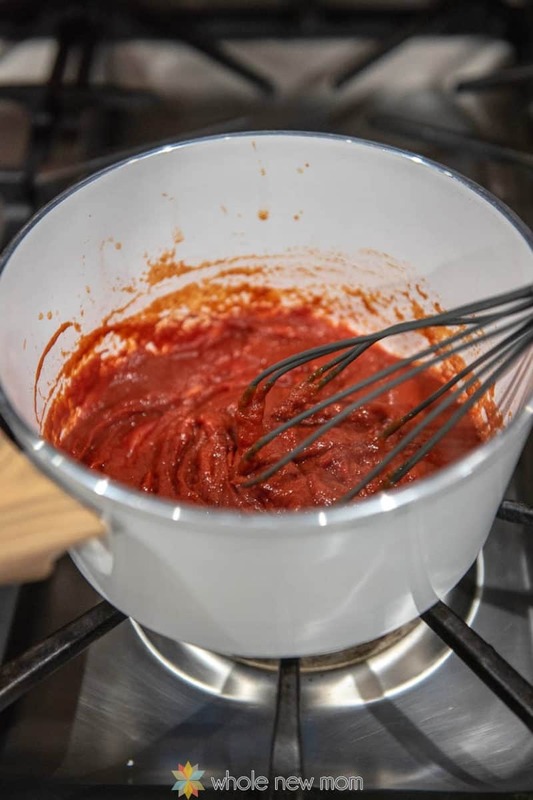 In a small saucepan, whisk the water into the tomato paste. Add other ingredients and cook over low heat for about 5 minutes. 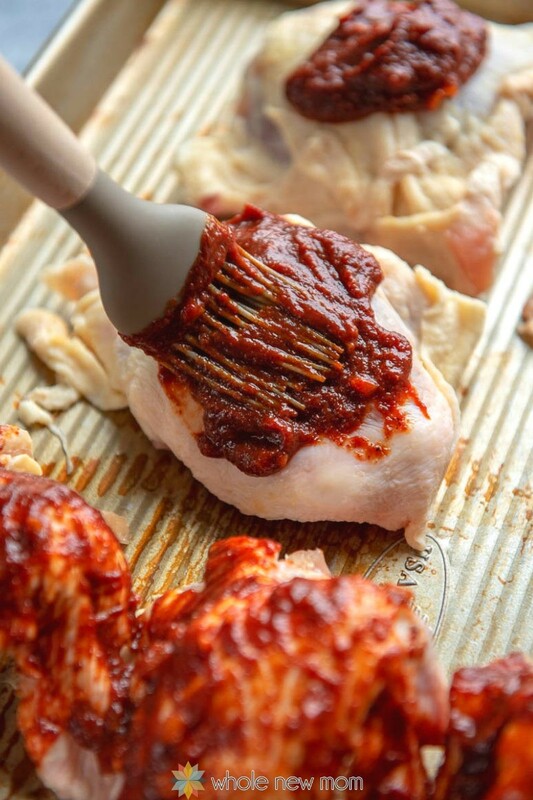 Spoon and spread evenly over chicken. Bake at 350 degrees (375 if you prefer more of a "grilled" effect) for 50 minutes or until internal temperature reaches at least 180 degrees. My family prefers the chicken more well-done so I cooked it a bit longer. One batch of the sauce is sufficient for one whole chicken weighing approximately 4 pounds, with perhaps a bit left over. Jarred tomato paste may be better due to BPA issues. Like we didn't have enough to worry about already! 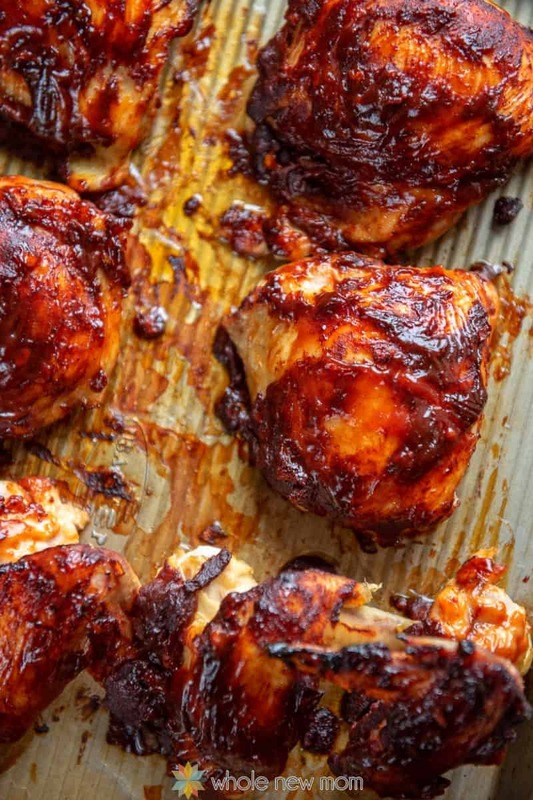 So go fire up your….uh…oven and have some great barbecue chicken anytime of year! Do you have a favorite chicken recipe to share? hahahaha having such a great time my first time at Your site!! 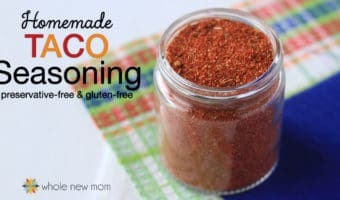 I have made my own seasoning blends as I said in my comment on Your recipe for soup base; but I have also had to create a bbq sauce for a friend that could have none of the regular stuff but also no vinegar!! but I did it!! I would have to find the recipe to check but I had to use my own tamarind for zest and some other things that worked very well!! You are so much a younger version of me with much better management skills!! SOOOO impressive Grrrl! I feel when reading so much of Your reasoning, beliefs and comments that You are copying me… cept we have never met, never talked and are decades diff in age and location so…. that didn’t happen!! 😉 Thank You for sharing Your brilliance, transparency and struggles with us all. YOU ROCK!!! Thanks so much–you made my night! Why avoid regular soy sauce? Couldn’t you use that instead of tamari? I avoid gluten and typically there is gluten in soy sauce. Often you can easily find tamari without any and even if it has it, it has less. It’s also more tasty in my opinion. Up to you! Thanks, Kelly! I was thinking about this one for you but forgot to mention in. Blessed Easter to you as well.